Pork chop. Chicken kiev. Smoked salmon. Not exactly what you’d expect from an inventive menu headed up by Jesse Dunford Wood, highly acclaimed chef and winner of Time Out’s Best British Restaurant award. Duck liver pate is more suited to an 80’s dinner party, surely? I think the last time I was offered Artic Roll as a sweet was during a hazy summer trip to a grandparent’s house years ago. And yet this is exactly what Parlour seems to have adopted as it’s USP - taking retro classics and adding more than enough character and pizzazz that it completely transforms your dining experience. The room itself is running with the idea of ‘Best of British, given extra cool points.’ Oxblood-hued booths make for comfortable yet chic seating, and there’s a stylish contrast of striking white tiles on the wall with dark wooden furniture (some of which looks reclaimed, like a shining church pew). Modern art on the walls is both intriguing and delightful to contemplate, and there’s a leafy shaded garden area that begs for summer days spent necking cocktails. We start the meal with the signature tipple on this cocktail menu – a ‘Not-In-Hill’. It’s a combination of Vanilla Vodka, Gypsy Lavender, Lemon & Sugar syrup. Sweet, silky and frothy, it almost tastes like a posset, and coats our tongues with the delicate taste of lavender flower. Definitely one to be explored. We’re also served some of the famous soda bread, and I have to refrain myself from completely devouring it – served warm, with a golden whip of lighter-than-air butter, it’s slightly chewy and doughy in the middle, which trust me, makes me all the difference. For starters, we decide to give a variety of options a go, since we can’t pick our favourite. All of the dishes have a touch of humour and seem like they might be concealing exciting, hidden secrets. We’re served the raw vegetable ‘ravioli’, and discover it to be wafer-thin slices of root veg (beetroot and kohlrabi), with a heavenly dollop of creamy goat’s cheese nestled between. This is one of our surprise favourites – the textures work so well, and sweet gems of cranberry combine stunningly with fresh crunchy veg and creamy, earthy cheese. We wolf down the hummus with pitta bread (actually made with chestnut and rosemary), and can’t stop popping the McTucky’s Popcorn Chicken Nuggets (better than any KFC you will eat in your life). One of the stand-out starters has to be the ‘Back-door’ Smoked Salmon – prepared just as it describes – which arrives in thick, sashimi-esque wedges of vibrant pink and hardly needs the lemon drizzle, so tasty is the lingering essence of bonfire. For main course, my dining partner goes for the famous Chicken Kiev, and it is as impressive as we’d hoped. 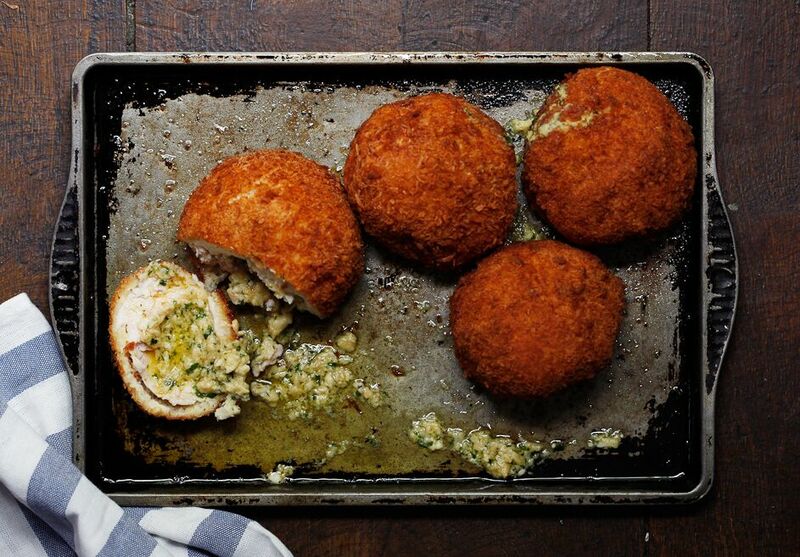 We spend some minutes figuring out how it’s assembled – a spherical orb of creamy sauce contained within chicken and coated in breadcrumbs, as it rests on a bed of mustard-speckled celeriac. Cut into it and the filling oozes out in a superbly satisfactory fashion, and the chicken is so tender it melts in the mouth. I have my eyes on the Cow Pie, beloved of Desperate Dan. For all those that have been disappointed by fussy little examples of this English dish, or been aghast at unwanted puff pastry, then this is the pie you’ve been waiting for. It fills the plate, with a gloriously golden pastry crust, and a bone-marrow sticking out the top like a proud mast. Inside are gargantuan chunks of steak swimming in rich gravy, and while it’s comfort food designed for scoffing, the flavours in the sauce are incredible. Somehow we make it onto desserts, where retro delights are evident once more – Rolo chocolates, for example, which are giant-sized versions of the confectionary we used to scoff as kids. They fairly erupt in the mouth with sticky, sweet caramel, and are the perfect accompaniment for an Odeon Old Fashioned. This is made with popcorn-infused bourbon, by the way, and not only tastes like sipping that cinema-staple, but also comes sprinkled with some. It makes its way swiftly onto my Instagram feed. We finish at Parlour feeling full, satisfied, and nicely tickled by the array of dishes on offer. But while the menu is cheeky and frivolous, the quality of the food is not messing about – and it’s evident a serious knowledge of ingredients has been applied. Parlour have taken the lacklustre British staples we’ve grown wary of, and cranked up the volume. Suddenly they’re appealing again, and I could eat my way through the whole thing twice.